At the end of each day players submitted their totals for the 5 five tasks they were keeping track of and discovered their standing in the morning. Below is an example of Day One's totals. The only rule for this game is that you have to submit some numbers for the different tasks. There is no rule against lying or cheating, in fact - players would probably figure out the game faster if they do lie about the different totals in an attempt to figure out the pattern and reasoning behind the game. You can see a very simple website for the game here. I'm still trying to find a better way to receive and tally totals - for this past game I used Survey Monkey and email (the server my site was on temporarily went down during the game). Importance: I wanted to test out how players limitations in real life differ from those in the game world. I also wanted to see if there would be any interaction between the players even though it was not an intrinsic aspect of the game play. I was also curious how dedicated people would be to keeping track of certain actions over a 5 day period. Method/Gameplay: I gathered 7 participants (2 graduate students and 5 adults with a typical work schedule) to play the game over a 5 day period. The day before the “first” day of the game participants were emailed a list of five things they needed to keep track of the next day. Players were told that the goal of the game was to figure out the pattern of scoring so that they could increase their totals and ultimately win. Players needed to submit their totals on Survey Monkey before midnight. They then received an email of everyone’s scores (using code names) before 10 am the following morning. The server that I had the site for the game on went down the day it started, so I had to email everyone with all the information each day instead of posting it for them to see. I do not think this had a huge affect on the functionality, but it probably did affect how immersed or attached players felt to the game because there was very little graphic look to it. 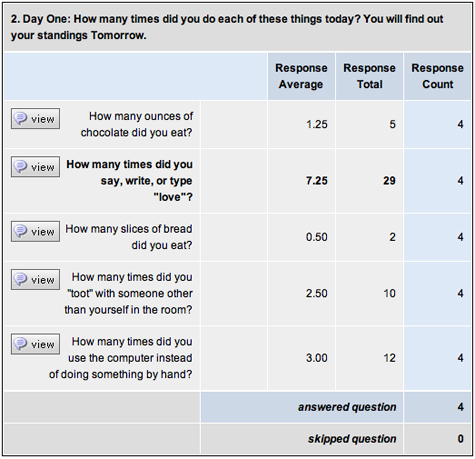 Survey Monkey was the easiest way for me to quickly get this experiment up and running, but it seemed a little counterintuitive. Players could see everyone’s email addresses when I sent updates - I did not send a blind copy to everyone. Scoring was based on how many times the whole group did things. The activity that was done the most was worth 5 points per time and the activity that was done the least was worth 25 points per time. So players got 5, 10, 15, 20, 25 points for each activity depending on how many times the group as a whole did it. Outcome: After the first couple days I started getting guesses as to what the scoring pattern was. On the third day one of the players responded to all after the scores went out, but it was only to taunt the other players because she was winning. As a game this was very unsuccessful. There was no climax, and when the game was completed it just seemed to fizzle out, but I did learn about players’ limitations within a game. After talking to players afterward, participants said they had not even considered contacting the each other to find out how many time they had done each activity. I was a little surprised by this, but I think the competitive nature of games won over collaboration. I was hoping that the need to know how it worked would cause players to contact each other and figure it out so that everyone would be a “winner.” Players also told the truth, or at least as close as possible, when submitting their totals for each day. This also surprised me a little. There is no way to referee the totals, so I had expected participants to submit start submitting extreme values to better understand the scoring system. I was with someone when she was submitting her totals and she looked into space trying to remember and counted each one on her fingers. On one of the days players needed to keep track of how many times the said the word “love,” and one of the participants submitted. I guess cheating is only accepted in the game world when it is sanctioned by the instructions, which can no longer be considered cheating, like in Illuminati by Steve Jackson Games.